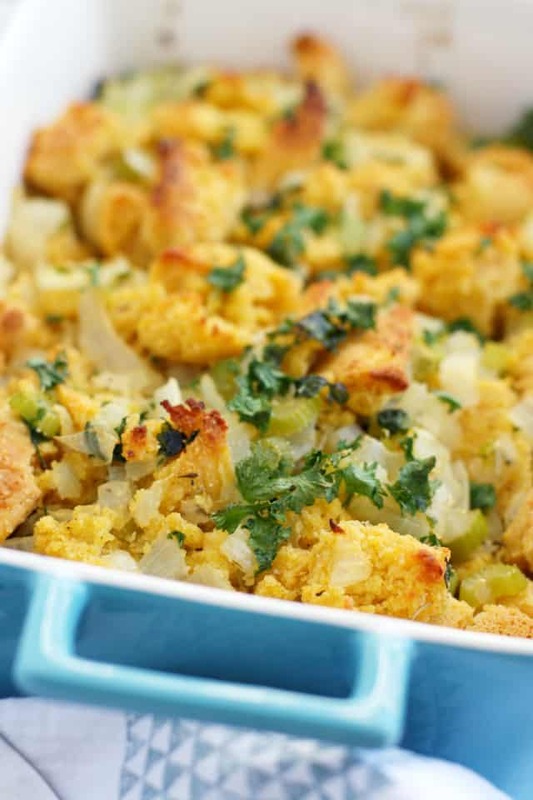 Home » Dairy Free » Cornbread Stuffing (Vegan, Gluten Free). 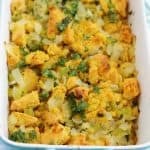 Cornbread Stuffing (Vegan, Gluten Free). Traditional cornbread stuffing, now made gluten free and vegan! This classic dish deserves a place on your Thanksgiving table! What’s your favorite part of the Thanksgiving meal? Mashed potatoes, sweet potatoes, green bean casserole, stuffing…or something else? There are so many good things to eat on Thanksgiving, and thankfully, many of them can be made to accommodate many dietary needs and food allergies. When I asked my Facebook followers what recipe they were struggling the most with for Thanksgiving, the answer was stuffing, mostly because if you have multiple food allergies, it’s really hard to find a safe bread. If you find a bread that’s gluten free, well, it probably contains eggs. Or else there’s a cross contamination issue with another allergen. It’s just really difficult to find store bought bread that works for everyone. 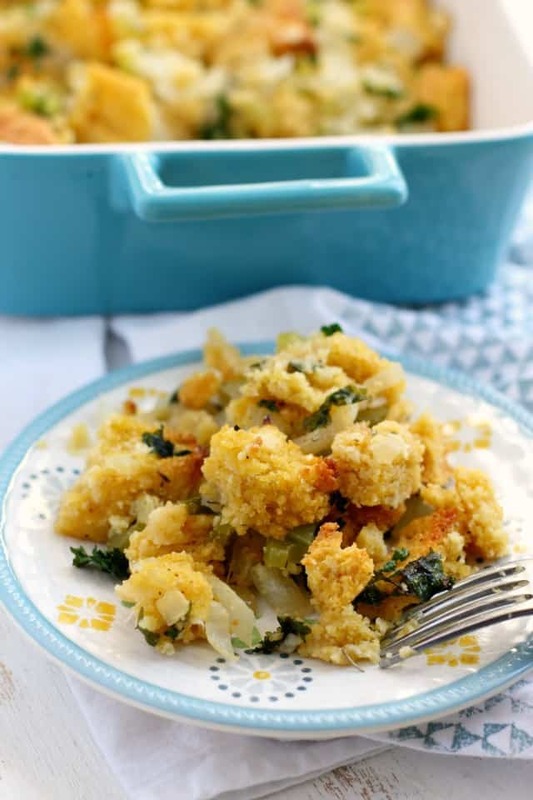 This cornbread stuffing is easy to make and just delicious. You make the cornbread, so you control what goes into that…the non-dairy milk, the brand of gluten free flour (or regular flour if you don’t need to be gluten free). Use your favorite yellow cornmeal that’s safe for your dietary needs. After making the cornbread, you do need to let it dry out. You can either let it dry out by leaving it uncovered for a day or so, or you can dry it in the oven at 200 degrees for about 90 minutes. Once the cornbread is dry, you simply add celery, onions, vegan buttery spread, parsley, and broth. It all comes together to make a pan of delicious, comforting, cornbread stuffing. It’s the perfect side dish for Thanksgiving. Or any occasion, really! 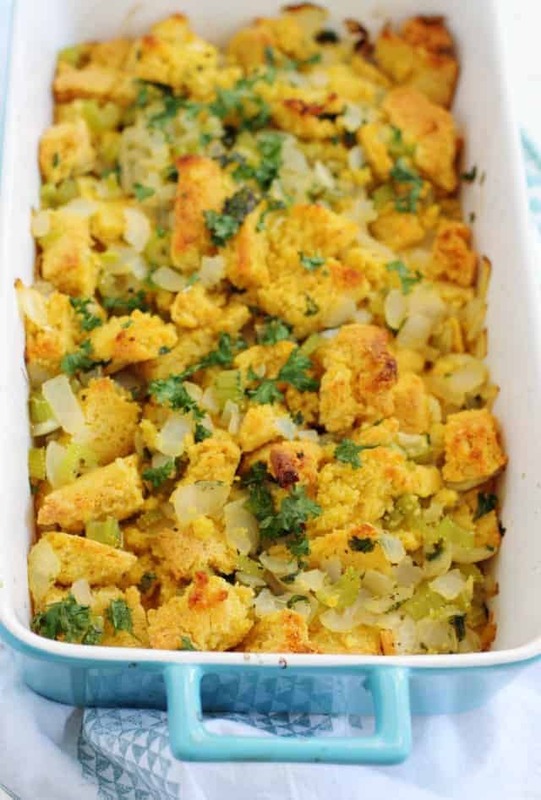 A gluten free and vegan version of classic cornbread stuffing. Perfect for Thanksgiving! Preheat the oven to 350 degrees F. Lightly grease a 9x13 inch pan. In a large bowl, whisk together the cornmeal, gluten free flour, sugar, salt, and baking powder. Add the applesauce, vegan buttery spread, and non-dairy milk. Stir until combined, then pour into the prepared pan, smoothing out with a spoon. Bake at 350 degrees for 20-24 minutes, or until a toothpick inserted in the center of the cornbread comes out clean. Once the cornbread is cool, slice into cubes. Set it out to dry on a cookie sheet for a day, or dry it out in the oven at 200 degrees for about 90 minutes. To make the stuffing: Preheat the oven to 375 degrees. Put the vegan buttery spread in a large skillet and melt it over medium low heat. Add the chopped onions and celery, and cook until they start to soften, about 10 minutes. Add half of the chopped parsley, broth, Italian seasoning, salt, and pepper. Bring to a boil, then reduce heat to low. Put the dried cornbread cubes into a 9x13 pan or casserole dish. Pour the broth mixture over the cornbread and mix together. Sprinkle the remaining parsley on top. Bake at 375 degrees for 20-30 minutes, until the top is golden brown. This recipe can be easily doubled! Just cook it in two separate pans so that there is enough of the crunchy top. If you’re planning your Thanksgiving menu, you may also want to try my vegan green bean casserole and the best dairy free mashed potatoes. « Crunchy Green Salad with Tangy Dressing. This was marvelous!!! I was invited to Thanksgiving dinner and asked to make a gluten-free, vegan, non-msg turkey dressing. I took this on as a challenge, found this recipe, and made it. I’m not gluten-free or vegan, so I purchased and “borrowed” ingredients. It was so good that I’d make it again in place of several family recipes I have — even if nobody else came to the party. Mmmmm. The key for me: right before putting it in the oven, look at the picture — have some of the cornbread cubes poking out the top. We didn’t have much in the way of leftovers, darn it! Made this for Friendsgiving. It was a hit for all involved, whether they were vegan or not! I’m making just the cornbread portion again today to go with a vegan chili. So good! So glad you liked this, thank you for letting me know! I’m not vegan but have some food sensitivities that really limit my menu options. This recipe is a lifesaver. I made it for myself to take for Thanksgiving, but left the house without it. :( BUT – my husband ate some with me with leftovers and now he is asking me to make this for him every week or two. His mom used to make a similar one (hers was super runny tho) but she passed away a year ago. I never thought to try to make this for him because it wouldn’t be the same…but he loves it. Thanks so much. PS how do you reheat it? So glad you liked it! Thanks for letting me know! You can reheat in the microwave or in a pan on the stove. I make this regularly now, omitting buttery spread and adding corn and sage. Stuffing without sage?! Never. Thank you. I thought my stuffing days were over. Fyi, I use Bobs Red Mill cornbread mix. So glad you like it! Your additions sound delicous! I’ve made a few of your recipes so far and will be trying the dairy free shepherd’s pie this weekend! Thanks for everything! I’m so excited to try this! I’m making it today, for a thanksgiving side tomorrow ? How long do I keep the broth mixture on low before pouring over the cornbread? I’m so excited to try this!! I’m making it for thanksgiving ? How long do we keep the stuffing mixture on low before pouring over the cornbread? Could I use coconut or almond flour for the gluten free flour? Any changes in ratio when doing this? Thank you!! Can’t wait to try this. I don’t think those flours would work, they would result in a very dense, wet cornbread. Hello Kelly..it is a very good idea for the celebration and also corn is always perfect to use. The only thing that might confuse people who want to cook vegan is the chicken broth option…many people want to please their vegan friends and might not know that chicken broth is not allowed by vegans. That’s a good point! Thank you for letting me know, I will make it clearer in the post. I used your recipe for the stuffing at Thanksgiving. It was very good. My husband said it was good also. Thanks so much for such helpful recipes for dairy and wheat allergies. I also have been using the Earth Balance spread instead of margarine. Thanks for the recommendation. It is a good substitute. Yay! I’m so happy you tried it and liked it! We made this for Thanksgiving and it turned out AMAZING! We would absolutely make this dish again for future events. Thanks for the wonderful recipes. Yay! I’m so glad you liked this recipe! Thanks for letting me know! What is a good vegan spread to use instead of butter? I have not found a good one yet. Thanks so much for the great recipes. They are such a great help to me. I am trying to cook for allergies and yet retain favorite foods for family. I like Earth Balance soy-free. I know for some reason that it’s not really 100% Vegan but Country crock(regular kind) is close enough to vegan for me and tastes sooooo good.